Maximizing small space | Fix It! Being a condo owner I am always looking for ways to make my small space seem bigger. This article in the National Post has some great ideas. I’m going to look into Tania Richardson’s idea about a dual purpose breakfast bar and I might even introduce some soft grey by repainting one of my walls. Installing a new breakfast bar or painting a wall are just the kind of small jobs that Fixit! handles. I think I could make this happen with only a few hours of one of our handyman’s time. It’s no accident everything has more than one function in the model suite for Jade Waterfront Condos. Each room in the 809-square-foot two-bedroom suite is used with purpose: Built-in couches extend into a kitchen banquette, a breakfast bar doubles as a dining table and a guest room can just as easily be a den. “We show purchasers how you could have a multifunctional space,” says designer Tania Richardson. Yet the suite’s soft grey palette, featuring dramatic touches in unexpected places, feels anything but utilitarian. “It’s luxurious, it’s timeless,” explains the principal partner with Tomas Pearce Interior Design Consulting. “There’s a serene element to it.” Suites at the Phantom Developments site range from 465 to 1,450 sq. ft. and start at $225,000. The sales office opens May 5 and is located at 2175 Lake Shore Blvd. W., Etobicoke. Hours will be Monday to Thursday from noon to 6 p.m. and weekends from noon to 5 p.m. For more information, call 416-251-0707 or visit Jade Waterfront Condos. 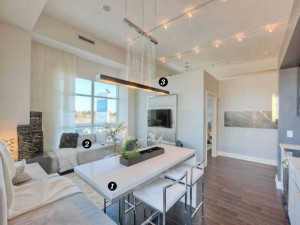 Posted in blog and tagged Condo, Etobicoke, installation, interior design, jade waterfront condos, Lake Shore Blvd. W, national post, painting, Phantom Developments, space, Tania Richardson, Tomas Pearce Interior Design Consulting, Toronto.